How to make Ivan Ramen's toasted rye ramen noodles. Have you guys ever watched Kung Fu Panda? It happens to be one of my favorite animated movies. It has everything: the laughs, the feels, and the hero’s journey featuring a fat and friendly panda. The movie starts off with Po, the only panda in a tiny bunny/pig village, a literal outsider in an ordinary world. He dreams of kung fu at night, but by day he works in his father’s noodle shop. Never have I felt so deeply about a scene in an animated movie – well, except from that time I cried for the entirety of the montage scene in Up, and that scene in Ratatouille where the critic eats Remy’s food. Honestly though, I really, really love noodles. I am totally noodle folk. That’s why it’s kind of sort of embarrassing to me that it took me so long to master the art of noodle making. But, I want to be clear: I’m no master, just a student – a very enthusiastic one at that. 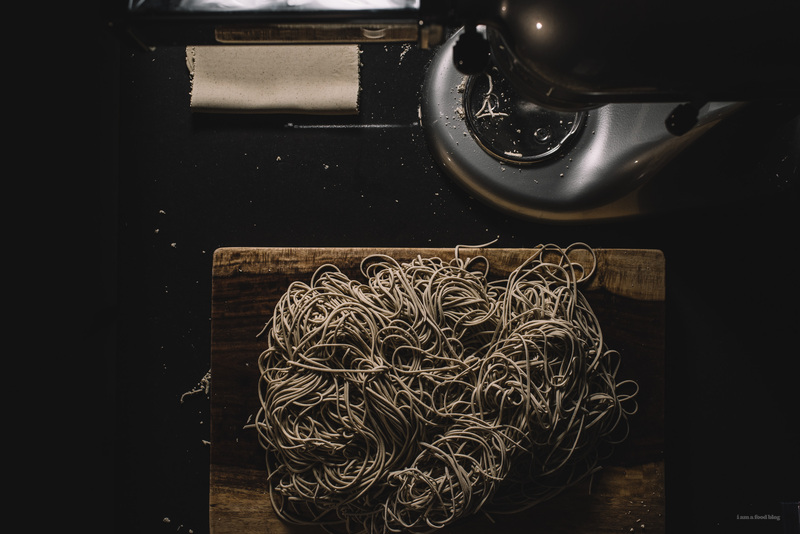 Noodle making, it seems, is both a precise art form and a throw it together kind of thing. If you ask any experienced noodle maker for their recipe, they’ll give you a guideline and offer vague suggestions, like, feel the dough and it depends on if it’s raining or not. The truth is, I should have been able to make noodles long ago. Some of my most cherished childhood memories are of my dad (never my mom) making noodles at our kitchen table. All those noodle making times have amassed themselves in my mind into one happy giant noodle party: my dad letting my brother and I crank the noodle cutter and my mom stirring a pot of meat sauce to dress the noodles. My brother and I would always get really excited when it was noodle making day. It was a combination of the fact that noodle making day didn’t happen very often and the fact that noodles were just that good. Dad: I tell you my recipe, it’s easy: flour and eggs. Me: But how much flour, how many eggs? Dad: You just look at it and you know. You mix it up and that’s it. The thing is, if you’re good, that is, if you have a lot of experience, you don’t need a recipe. You really can throw together a dough and have it come out delicious. How do you think all those Italian grandmas do it? For the rest of us more experienced noodle eaters and inexperienced noodle makers, you need a noodle guide. Someone who will figure out the ins and outs of noodle making and show you the way. Luckily for you guys, you have me. And luckily for me, I have Mike, who figured out how to make noodles from scratch on a whim. Our noodle journey started with pasta, which, like my dad’s egg noodles, are a fairly easy noodle to make due to its relatively high hydration. 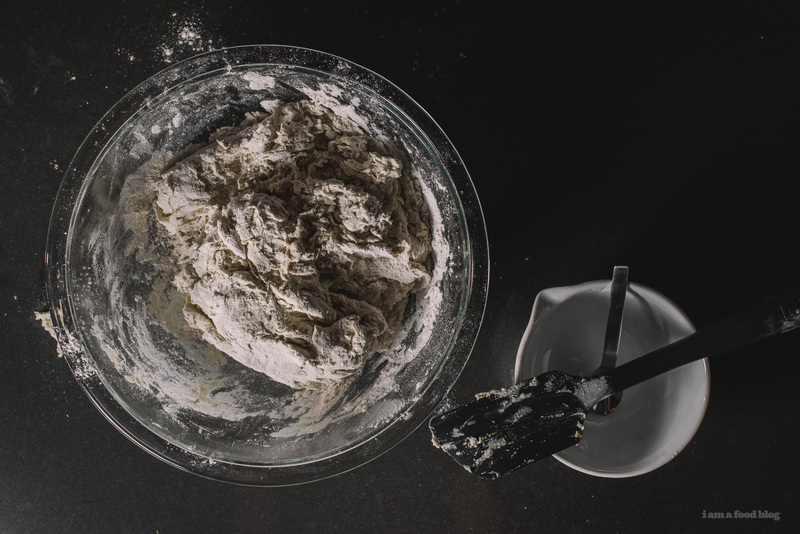 Typical pasta doughs are a ratio of 3 parts flour to 2 parts egg, which is around 30% hydration. Lots of doughs start out with a high hydration because those doughs tend to come together easily. But the thing is, the higher the hydration, the softer the noodle when you cook them. 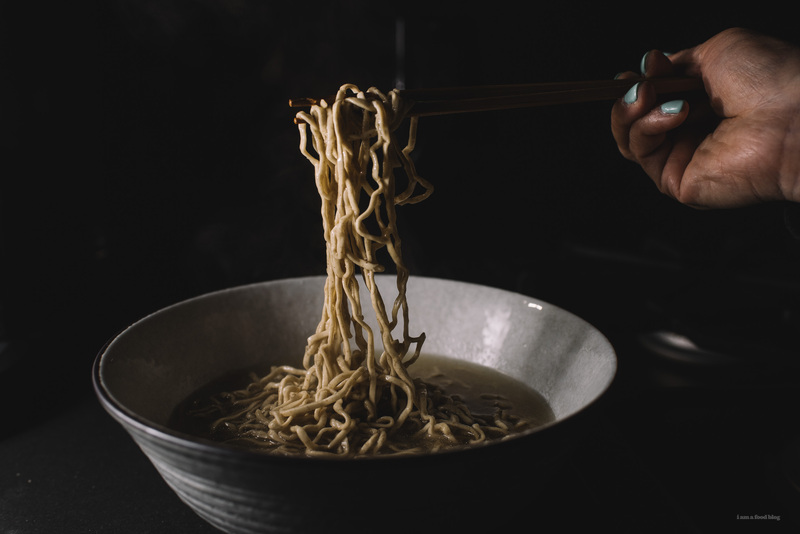 Noodles, to me, are all about that al dente bite (mochi mochi, in Japanese), so if you can dial down the hydration, you’ll end up with a chewier, more satisfying bite. Mike’s first couple of rounds of pasta experimentation were successful, so he decided to move on to one of our favorite noodles of all time, ramen noodles. At first he tried a random recipe from the internet, and while good, it wasn’t quite where he wanted it to be. We agreed that we were looking for something light, yet hearty, chewy without being dry. We wanted something that would hold up to the intense flavors of ramen stock, but also bring it’s own personality to the party. We wanted Ivan Ramen’s toasted rye noodles. Ivan, if you haven’t heard about him, is a former Tokyo transplant via Long Island, New York. These days, he’s back in NYC doing his noodle thing, but he earned his noodle chops by opening a ramen shop in a suburb of Tokyo. He’s got an interesting, inspiring story. 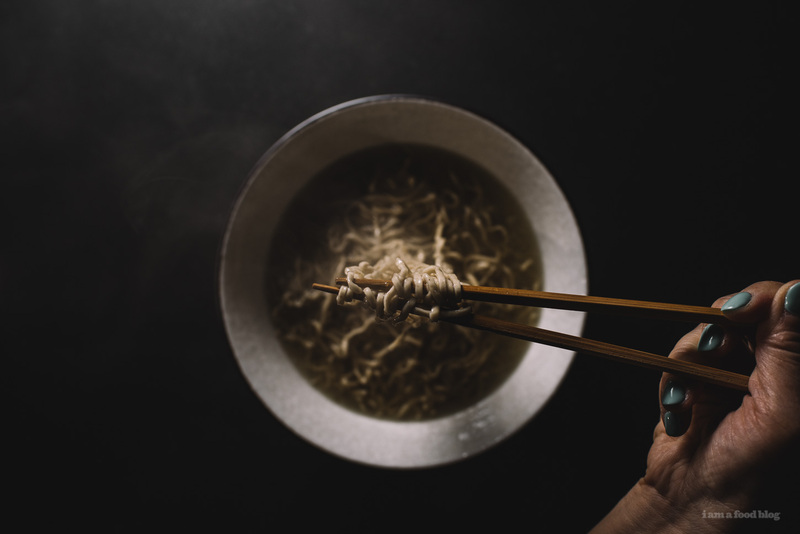 He also has a cookbook that details how to make a thin, soba style ramen noodle, which is perfect for his light and refined shio (salt) ramen. Ivan’s recipe for rye noodles uses a combination of high gluten bread flour, a lower protein cake flour, and rye flour, for flavor. 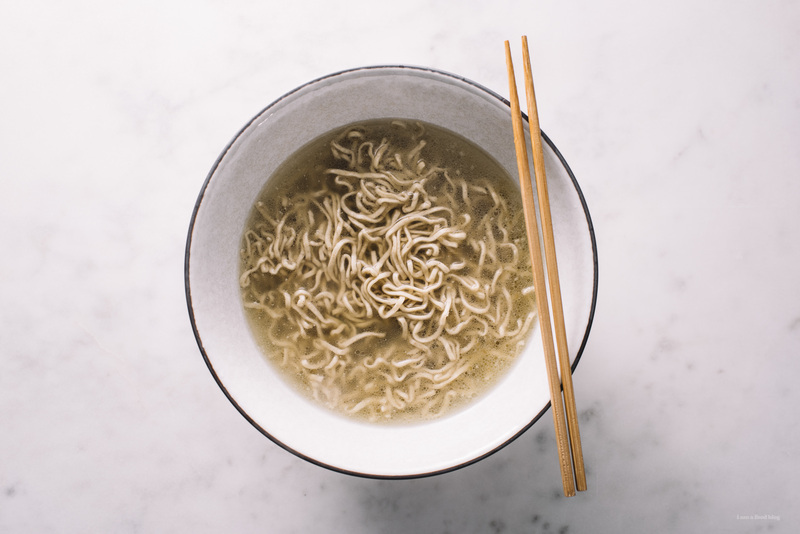 You end up with about a 10-11 percent protein flour –the typical protein percent for ramen, which you could potentially buy, as all purpose flour, but combining the various flours gives you a complex, well textured noodle, with whole grain speckles. Toasting the rye flour gives it depth and an extra bit of aroma, which I find absolutely intoxicating. Ivan’s recipe, along with a three-flour mix, also has kansui powder, which is responsible for alkaline part of the noodles. 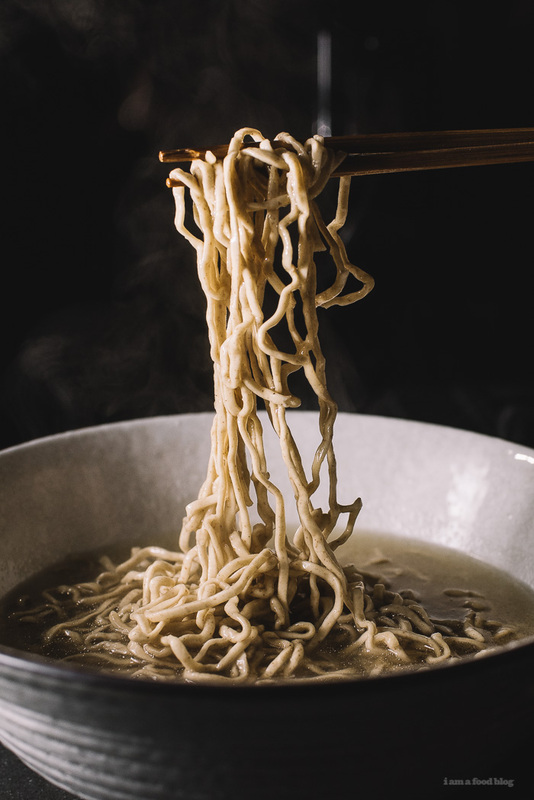 Alkaline is added to a bunch of different noodles (Hong Kong style egg noodles, hand pulled noodles, etc) – it gives certain types of noodles their signature springy bounce and chew. You can buy kansui powder, but it’s pretty easy to make as well: simply spread a thin layer of baking soda on a foil-lined cookie sheet and bake for 1 hour at 250˚F. Along with the flour and kansui, there’s water and salt. And that’s it: you’re four ingredients –6 if you count the flours separately– from fresh homemade ramen noodles. Of course, it isn’t as simple as that. It can be pretty frustrating making this particular ramen recipe if you haven’t worked with low hydration doughs before. The problem with low hydration is that you start of with a very crumbly, dry, barely sticking together dough. After the initial “kneading” stage, you think that it won’t work, but wrap up your shaggy, barely-even-a-ball-of-dough in plastic wrap and let it chill out for at least an hour on your counter top. After an hour, it’ll still be shaggy, but most of the flour will have had a chance to hydrate and you’ll be able to knead it using your pasta machine. The pasta roller is definitely your friend in this case. Use it on its lowest setting to knead, folding and re-rolling and eventually you get a perfectly dry, yet supple noodle. It’s been a long journey of not so great noodles, okay noodles, and all of a sudden really awesome noodles. Mike’s made countless batches and I’m on batch four and I have to say, we’re addicted! It’s amazing that you can take flour and make into a delicious tangle of noodles. I’m so happy that I’ve achieved the noodle dream. After all, I’m noodle folk. Broth runs through my veins. This recipe is essentially the same as what you’ll find in Ivan’s book. There are a few key differences: the recipe is halved, the water content is very slightly lowered, I’ve made this on different days and adjust according to the weather. Rainy days definitely need less water in the dough. The other difference is the kneading method – Ivan has you knead the dough in a mixer on low for 10 minutes. I tried kneading the dough in the mixer, but my KitchenAid had a tough time of it, it made a lot more sense to use the rollers to knead, as seen in the video. To make the kansui, spread a thin layer of baking soda (about 1/4 cup but you won’t use all of it) on a foil-lined cookie sheet and bake for 1 hour at 250˚F. Let cool completely and store in an airtight container and use as needed. Dissolve the kansui powder and salt in the 200 milliliters of water in a bowl or liquid measuring cup. Set aside. Toast the rye flour in a nonstick pan over medium-high heat. Stir constantly until it starts to smell toasty. You don’t want the flour to color, so keep your nose close to the pan. Once you start to smell it, remove it from the heat. Measure out 35 grams of rye (you start with 40 because you lose some weight to toasting) into a large bowl. Weigh out the bread and cake flour in bowl and mix throughly. Slowly stir in the water-kansui mixture. A very shaggy ball will start to form. Give it a quick knead to try to get all of the stray pieces to come together, but don’t worry about it too much. Wrap the dough tightly with plastic wrap and let rest, at room temperature for at least an hour. After an hour, the dough should be slightly more hydrated, but by no means will it represent any dough you’ve seen. Give it a quick knead and divide it into 4 equal portions and keep them tightly wrapped. Set up your pasta machine on the largest setting (1). Take one portion of dough and squish it (as much as you can) into a rectangle shape. Turn the machine on and run the dough through. It will start out shaggy, raggedy, and will probably tear. Fold it over on itself so you have a double sheet and pass it through the roller again. Keep folding and rolling the dough until you get a smooth, silky noodle sheet. When you’re satisfied with the look and feel of the noodle sheet, decrease the setting to 2. Fold the sheet over and run through twice before decreasing the setting to 3. We like to adjust our noodle thickness depending on what stock we’re serving with, so at this point, decide if you want a thicker noodle or a slightly thinner noodle. In the video, I take it to setting 4 before switching to a cutter and cutting it. Repeat with the remaining 3 portions of dough. At this point, portion out your noodles into 3.5 ounce servings and, if you like, you can give them that signature crinkly ramen look by squishing them into a tight snowball and then shaking out. If you added more water than the 200 ml, lightly dust the noodles with cornstarch before squishing. Wrap the portions tightly in plastic wrap and refrigerate. To cook, bring a pot of water to hard boil over high heat. Make sure your stock is at a simmer on low heat. 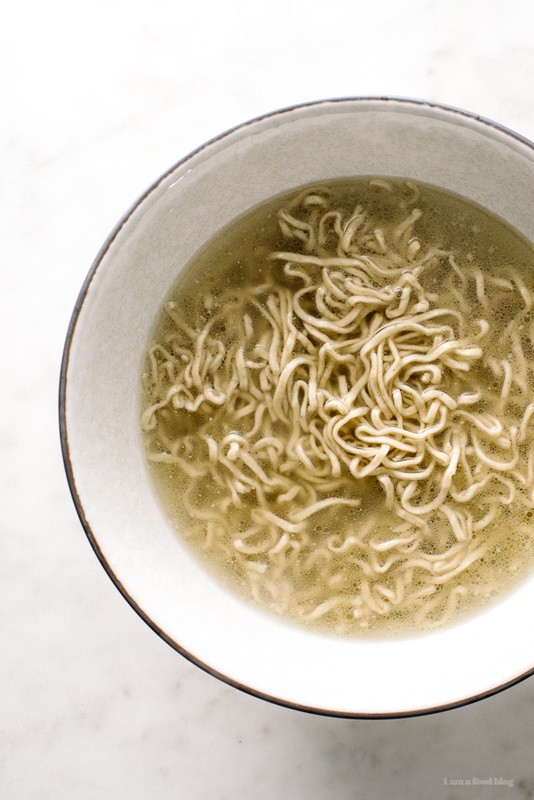 Warm up your ramen bowls by filling with hot tap water. When everything is ready (toppings included if you have any), drop the noodles into the water and set a timer for 50 seconds for al dente noodles. 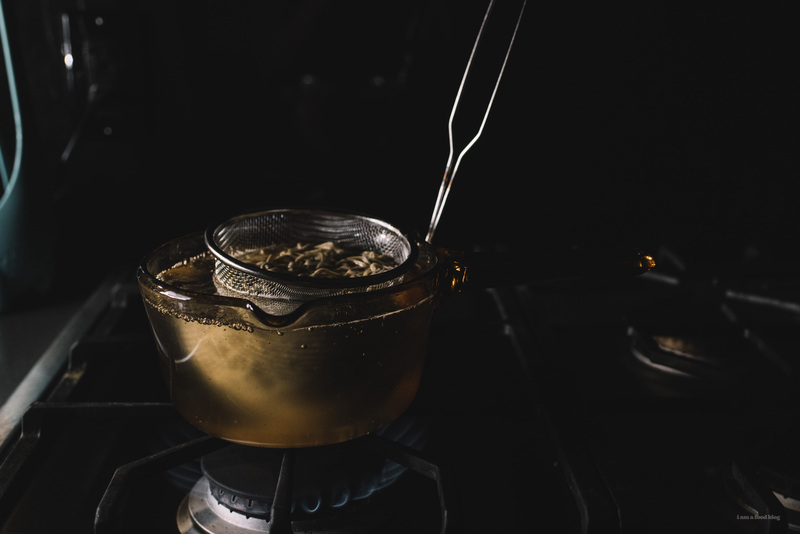 When the timer has 10-15 seconds left, pour out the hot tap water, fill your bowl with hot soup and set aside while drain your noodles, shaking off as much excess water as possible. It helps if you use a noodle basket, otherwise a strainer works as well. Place the noodles into your stock. 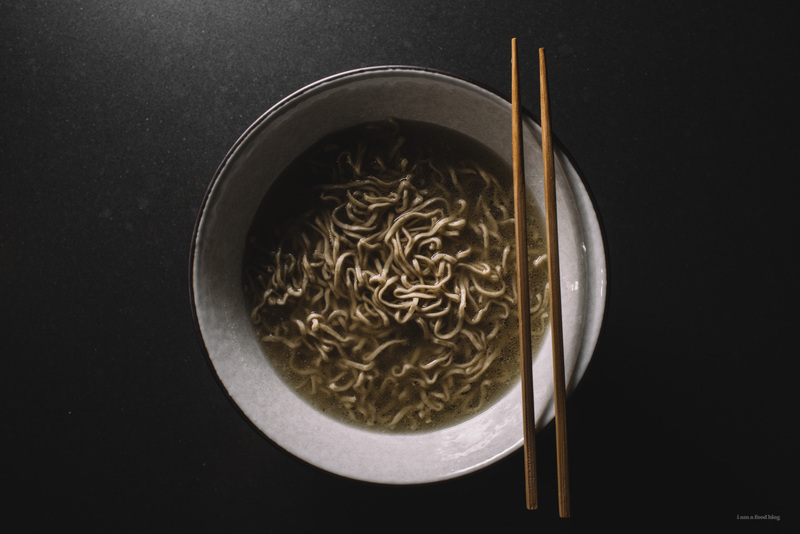 Use a pair of chopsticks to loosen, lift, and fold the noodles back on top of themselves. Place on your toppings and enjoy immediately. Notes: Ivan suggests 215 ml, but I think that’s too high. But, if you do need to add extra water at the shaggy dough stage, do so, a teaspoon at a time, with caution. You can always add more water later if needed, but you can’t really un-hydrate dough that has too much water in it. PS – I’m not going to lie, if you’re committed to making Ivan’s Shio Ramen, you have to be truly committed. This is just one of ten components that go into a finished bowl. I’ll be posting the other recipes shortly! Ahh making our own noodles is such a bucket list item! These look amazing, I can’t imagine how good they must have been! I am so impressed by your noodle-making! I am still so daunted by them and I know I should just try, because you know, practice, but still. This amazing-looking dish may help me take the leap. I just watched that movie for the first time this past weekend – how have I waited this long?! 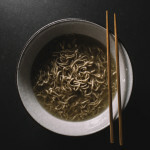 These photos are absolutely stunning and homemade noodles are so intimidating to me, but this post is reallllllly making me what to give them a try! I LOVE THIS. I don’t buy pasta/noodles often because when you make it at home it a) tastes way better b) you make it way less often and don’t eat all day everryday (which is a plus and a minus i guess). Excited to see the other components!! This is the same conversation I have with my mother and grandmother. NO MEASUREMENTS EVRR!. Just a splash of this and you have to “feel it with your hands” or just mix until it looks “right” WHAT? These look so good. I love the rye. I LOVE these photos, Steph! That whole tangle of noodles on the cutting board. UGH! So cool and they look absolutely delicious! Thanks for sharing! I’ve just made my first batch of ramen. Using bread flour, warm water, and liquid kansui. Came together beautifully the first time. They were so good. Just the right amount of chew. My next run will be Ivan’s recipe, probably with some alterations. My first, real, tonkotsu broth came out beautifully. Thick, opaque, fatty, intense flavors. Of course it took 3 days to get to that stage. can I ask if you used equal Koon Chun liquid liquid amount that Stephanie says to use in this recipe? 200ml? I can’t find the powder kansui anywhere locally but i know i’ve seen the Koon Chun here. thanks stephanie. i actually did your recipe exact and it came out fantastic. i don’t think i toasted my rye enough (too scared it would brown and burn) lol, nonetheless it still tasted great and we put it in our nabe soup. um, i feel like i am po. does everyone feel that way? perfection, i’m soooooo obsessed!!!!!!! can we make this together? ps you’re my favorite noodle folk!! Steph! 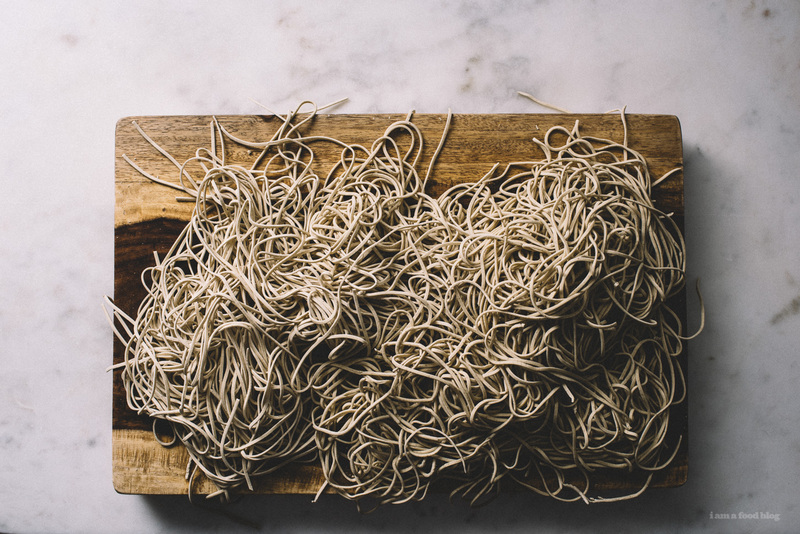 I’m in love with this story and your newly acquired noodle prowess. How precious is your father and his take on noodle making?! Genius. You’ve seriously inspired me—cannot wait to try my own. This is so impressive… That last perfectly smooth sheet of dough! And SERIOUSLY. The woes of talking to cooks from another generation. Exactly what Adrianna said below. My bf’s Nonna always says: “You have to FEEL it. You know it’s done when it feels done”. This is the coolest thing EVER. And the most beautiful photos!!! Just finished making this with my girlfriend in Texas during hurricane Harvey. Very nice date day and absolutely turned out amazing. She is a Ramen lover from Japan and couldn’t believe how well the noodles came out. I have never been to Japan or eaten Ramen…all I know is that it was awesome. Thanks so much for posting this. This blog is now on my weekly visit list. Have you ever tried keeping the noodles in the fridge? How long will they keep? yes, they should keep in the fridge for a couple of days for maximum freshness, but we’ve had week old noodles too without any issue. hope that helps!